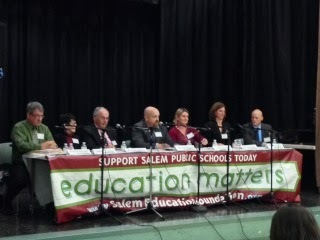 SALEM—Despite competing with game five of the World Series, the Salem School Committee Candidate Forum drew close to 100 people Monday night, Oct. 28, at the Nathaniel Bowditch School. It was the last opportunity for voters to hear from all six candidates before the Nov. 5th elections. Three incumbents— Janet Crane, Lisa Lavoie, and Brendan Walsh—joined three challengers— Rachel Hunt, Rick Johnson, and Patrick Shultz—as each candidate campaigned for a spot among the three available positions on the seven-member board. The nearly two-hour forum included introductions, statements, and rebuttals from each candidate and ended with a 20-minute question and answer period from residents. Moderator Dave Olson, editor of the Salem New, read questions from note cards that had been passed around at the beginning of the meeting. During the introductions, the candidates were asked to define what they saw as a priority for the people of Salem in their schools. Johnson said he was encouraged to see that people are engaged and knowledgeable about Salem’s schools, but he notices a lack of results. “People are ready for results now,” he said. The topics of discussion shifted towards middle school improvements and extended school days and years. One question addressed the qualities needed in new school district employees, primarily a principal or teacher. Hunt said she would look for a principal with knowledge and experience in an urban setting along with demonstrated results in their work. Walsh pointed to the importance of experience and a greater understanding of the learning process. He also would look for another quality: “If you don’t have people skills, you are going down in flames,” said Walsh. Most of the candidates agreed with the necessary enforcement of the accelerated improvement plan, like Hunt, Shutlz, and Lavoie, who is already a member of the plan’s committee and sees the need for collaboration among schools in the area to strengthen the plan. As to Salem middle schools, candidates said they saw the need for improvement, but hesitated to disrupt what is already in place. “We shouldn’t put the cart before the horse but make sure we look at all of the evidence, because the middle school might not need a new model,” Shultz said. Every candidate—except Crane—is in support of extended school days and years. “It shouldn’t be a secret that I am in favor of adding time to the day; students can benefit from the extra time, and we can even explore staggering the teacher’s schedules,” said Lavoie. Each candidate pushed for intensive tutoring for students who need more specialized attention, but cited expenses as an obstacle. Lavoie suggested they needed to be creative and look for community partners to help with funding. Each candidate hoped to increase the involvement with Salem State University in the local schools with student teachers and tutoring programs, and also acknowledged the work of programs with after school providers like the YMCA and the Boy’s and Girl’s Clubs. What two accomplishments did the candidates want to achieve by next fall? Shultze said he hoped to work closely with the ELL director to recognize funding needs and areas of improvements; Johnson expected to create leadership training and communication between parents and students, especially those with special needs. Hunt would like to see a greater educator evaluation support system to leverage accountability and support the superintendent and a stronger focus on policy and budget. Lavoie pushed to implement the instructional rounds more, which would create collaboration between principals and teachers. Walsh wants to stabilize the leadership team who is knowledgeable about Salem and be in place for a longer amount of time. “We need increased educational opportunities for the neediest of our students, like an in-home tutoring program, which is cost effective and informative,” said Walsh. Crane would like to use the Carlton model, especially in middle schools, which allows students to proceed at their own pace, while also placing creativity and compassion back into teacher evaluations. You actually make it seem so easy with your presentation.this information is helpful to me in my topic Essay Writing Help ill appreciate to you good job keep it up. i think if you are writing an admission essay then it will be very unique to grab the attractions of admission committee..
my high school days are special and these writing services made it soooo wonderful.. I am glad to see that the committee is finally thinking about exploring the issues in the institute. I hope they will make efforts to fix the issues as well. I wish committee in my university will do that before the coming the election. logo design Dubai. This will bring some nice changes. Everyone candidate hoped to increase the involvement with Salem State University in the local schools with student teachers and tutoring programs, and also acknowledged the work of programs with after school providers like that Boy’s and Girl’s Clubs. This is a great news for Gordon College students. Logo design service. They will now be able to solve those issues that they were facing for sometime. Education does matters because without education you are not able to participate in the competition of tough professional life. AllAssignmentHelp.com provides plagiarism free assignment solution at the lowest cost. We provide high-quality service and provide free plagiarism report for all assignments. There are no extra cost of plagiarism report, it is free. Personal Finance Planning Assignment Help | Assignment Help UAE . There should be enough room for the voters to listen the the ideas and ideologies of the candidates. It will further strengthen democratic values. Do keep in touch with Essay Writing Service UK for more articles on this. The Female Escorts of Manali are very remarkable and incomparable with other escorts of other agencies hire both incall and outcall best Manali Escorts Services. What a nice and a great post you have created. It is not every page you open and find relevant information, but in this case i am contented with what i see. I would like to see this again. Facebook page creation help offered by the best.experts. Great job.Really i would like to appreciate you. News have very importance in every one's life especially for students. It helps to improve reading skill and improve general awareness. To improve writing skill contact Term Paper Writing Services Reviews.They will provide proper help. I think, they are prepared well for the event. That is why they included introductions, statements, and rebuttals from each candidate and ended with a 20-minute question and answer period from residents. Your article is informative and interesting. Keep sharing your posts! This was a very impressive, informative, awesome post. Thanks for the such a awesome post. We all want academic help. There are many website that provides these. There should be enough room for the voters to listen the the ideas and ideologies of the candidates. It will further strengthen democratic values. EssaysMine.com is an online Essay Writing Service Company which provides the services of more than 500s of highly professional, talented and experienced writers for your academic papers. The elections must have been very interesting. I also would like to thank the speaker for stepping up and running for office and caring about the schools. This actually portrays love and loyalty which is quite commendable. Need Dissertation Writing Service? Feel free to contact our experts at anytime. Foot Locker has announced that they’re restocking the adidas NMD R1 Primeknit “City Pack” in the “Japan Black”, “French Beige” and “Japan Grey” colorways.This is the first time Foot Locker has restocked adidas nmd these releases. The trio of releases will hit FootLocker.com at 10AM EDT.Below we provide you with direct links to Adidas Yeezy each adidas NMD release. The retail price tag is set at $170 USD. Good luck. The adidas NMD City Adidas Ultra Boost Pack will be joining both the Air Jordan 1 restocks that are scheduled for November 15th.According to Foot Locker, yeezy shoes the adidas NMD City Pack which includes the the “Japan Black”, “French Beige” and “Japan Grey” colorways will be adidas nmd for sale restocking once again.This time around, the restock of the adidas NMD releases will be available exclusively online at Footlocker.com Adidas Basketball Shoes on November 15th. The retail price tag is set at $170 USD each. The adidas Ultra Boost 3.0 will yeezy boost 550 soon be releasing, which includes this adidas Ultra Boost 3.0 “Mystery Blue” colorway.Dressed in a combination of Mystery Blue Kobe shoes and Vapour Grey color scheme. This adidas Ultra Boost features a full Blue Primeknit upper with a Grey heel nmd adidas counter. Completing the look is a White Boost midsole and Black Continental rubber outsole.Check out the official images below Adidas Pure Boost and look for this women’s exclusive adidas Ultra Boost 3.0 “Mystery Blue” colorway to release this December 2016. The adidas store retail price tag is set at $180 USD. Elections have been ended and lets see that in December which candidate electors select. Dissertation writing services have conducted a complete research on elections that can be seen on their official blogs. This is an good post after school days..
girls also wear salwar suits for school days. School elections are always very suitable, seeing that the administration cant handle the whole school on their own. I really like the way that the school committee explored issues before elections, making everything easy for them. You sharing is highly appreciated. It is an encouraging step.I welcome all mentioned statements about training.Writing Essayz provide customized essay writing services for all level of students. Good way for describe facts. Well planned and preparation done by the committee. Reinvent shopping with TheFeMall by its dazzling collection of Kaftans you are sure to have your heart on it! The range of clothing is simply amazing and we are the best place where you could buy Kaftan in Dubai with outstanding colors and styles. Very well planned by the authority. Appreciated. Do you want a Sugar Mummy in your area? Do you want to get paid to love an older woman? Then visit the Sugar Daddy Dating Site. Dhoni has been removed as captain from Rising Pune SuperGiants, Now Steve Smith to handle the captainship for Pune. Every one love to see their child on top most college admission & educated. also clever post. I definitely enjoyed my first read throughout this post. Have a look at: Whatsapp DP.